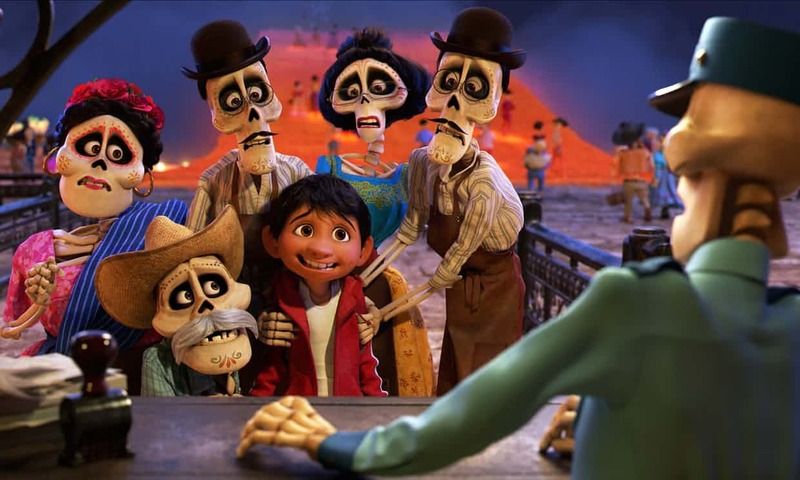 Miguel is a little Mexican boy who lives with his close-knit extended family, complete with seemingly ancient and senile great-grandma Mama Coco. His family are shoemakers but Miguel dreams of being a musician like his hero - the famous but now dead singer Ernesto de la Cruz (Benjamin Bratt). The only problem is that Miguel's family are against music of any kind and are determined not just to make Miguel a shoemaker in the family tradition, but to erase all memory of his Mama Coco's father - another wannabe musician who apparently abandoned his family. The consequences of this are that his great grandpa's photo is not laid out with the rest of the ancestral portraits on the Day of the Dead, so that he cannot visit with his family. Of course, this is just pre-amble. The story truly begins when Miguel is magicked into the world of the dead, and begins a quest to find Ernesto de la Cruz and get his blessing to return and to sing! Along the way he learns much about his family history, and also about the pride and love of coming from a large family. In COCO, director Lee Unkrich (TOY STORY 3) creates a truly wondrous, uplifting and profound film of the kind that only Pixar seems able to create. The animation was bold, beautiful and kinetic - the music truly memorable - and the story well-paced and exciting. But what makes this film stand out is its nuanced and meaningful examination of the ties of family and the dangers of legacy and the power of memory. It'a film that resonated with me - coming from a large Asian family - and I'm pleased to see old grannies taking off their shoe to scold an impudent upstart is not just an Indian trope! Most of all this film made me cry. And not the cheap deliberately engineered tears of a manipulative melodrama. But genuine, hard-won tears from investing in a little boy's story, in his family, and seeing a loving reconciliation. This is animated storytelling at its most ambitious, intelligent, and affecting. COCO has a running time of 105 minutes and is rated PG. It is on global release.